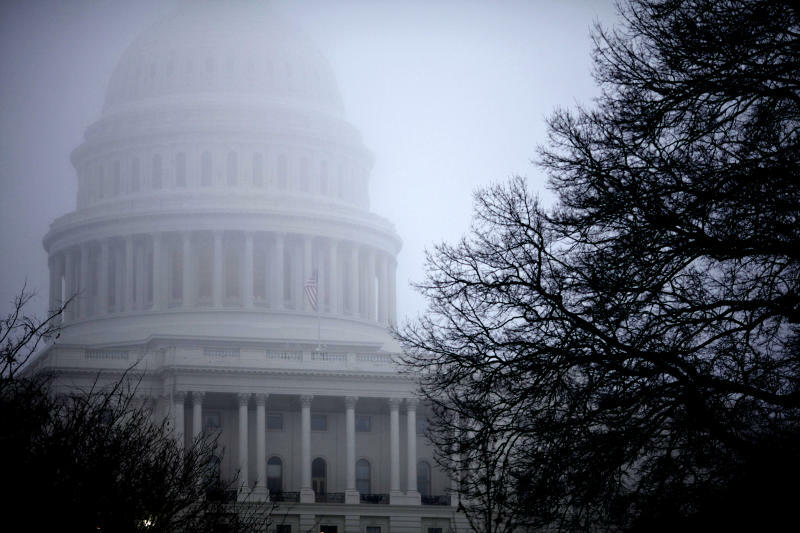 Congress and the White House fail to strike a budget deal by New Year's Day. Their stalemate triggers sharp tax increases and spending cuts. Those measures shrink consumer spending, stifle job growth, topple stock prices and push the economy off a "fiscal cliff" and into recession. The reality may be a lot less bleak. Even if New Year's passed with no deal, few businesses or consumers would likely panic as long as an agreement seemed likely soon. The tax increases and spending cuts could be retroactively repealed after Jan. 1. It's always possible that negotiations between President Barack Obama and Republican congressional leaders will collapse in acrimony. The prospect of permanent tax increases and spending cuts could cause many consumers and businesses to delay spending, hiring or expanding. — Though the fiscal cliff would cost the economy an estimated $671 billion for all of 2013, the tax hit for most people would be slight at first. The expiration of Social Security and income tax cuts would be spread throughout 2013. For taxpayers with incomes of $40,000 to $65,000, paychecks would shrink an average of about $1,500 next year but an average of just $130 in January, according to the nonpartisan Tax Policy Center. — About a third of the tax increases wouldn't touch most Americans. Some would hit businesses. Others, such as higher taxes on investment income and estates, and the expiration of middle-income tax credits, wouldn't come due until Americans filed their 2013 taxes in 2014. — If a deal seemed imminent, some experts say the Internal Revenue Service could delay the increased tax withholding that's due to kick in. Without a deal, the top income tax rate for single people with taxable income between about $36,000 and $88,000 would rise from 25 percent to 28 percent. A delay in the increased withholding would ease the initial tax hit. — About $85 billion in spending cuts to defense and domestic programs would take weeks or longer to take effect. That means government agencies wouldn't cut jobs right away. Still, if budget talks dragged on, many businesses might put off investment or hiring. That's why most economists say it would be crucial to reach a deal within roughly the first two months of 2013. Already, uncertainty is causing some businesses to delay spending. Consider Apex Tool and Manufacturing, a 10-person shop in Evansville, Indiana, that makes parts for the automotive glass, telecom equipment and plastics industries. Sales have picked up. Company President Terry Babb says he'd like to spend about $150,000 to buy a computer-controlled milling machine. A couple of years ago, Apex earned too little for Babb to even worry about taxes. Yet he's reluctant to absorb new costs until he's sure what tax changes are coming. A tax break for companies that invest in new equipment is set to expire. Companies can't claim that break unless new equipment is on site before year's end. Machinery can take weeks to arrive, meaning it's too late for Babb to claim the credit this year. Federal Reserve Chairman Ben Bernanke said Wednesday that the uncertainties about taxes are holding back the economy by causing businesses to postpone investment and hiring. "Clearly, the fiscal cliff is having effects on the economy," Bernanke said. Many more people would be affected if something called the alternative minimum tax isn't fixed. The financially painful AMT was designed to prevent rich people from exploiting loopholes and deductions to avoid any income tax. But the AMT wasn't indexed for inflation, so it's increasingly threatened middle-income taxpayers. Congress has acted each year for a decade to prevent the AMT from hitting many more people. If it isn't fixed again, roughly 33 million taxpayers, including married couples with income as low as $45,000 — down from $74,450 in 2011— could face the AMT. Previously, only 5 million taxpayers had to pay it. Taxpayers subject to the AMT must calculate their tax under both the regular system and the AMT and pay the larger amount. The IRS has said it assumes Congress and the White House will fix the AMT in a deal to avoid the cliff. If they don't, the IRS will need weeks to reprogram computers and make other adjustments. In the meantime, nearly 60 million taxpayers couldn't file tax returns early next year because they couldn't determine whether they owe the AMT. Refunds would be delayed. One immediate spending cut would be the end of extended unemployment benefits. Most states provide benefits for 26 weeks. But since 2008, the federal government has provided an emergency benefits program. This adds an average of 32 weeks, depending on the state, for a total of 58 weeks of benefits for the long-term unemployed. If the extended benefits end Jan. 1 as scheduled, about $30 billion would be saved next year. But without that money, about 2 million people who have been out of work for more than six months would lose benefits averaging about $320 a week. Economists note that recipients of unemployment aid tend to spend that money quickly, giving a lift to the economy. The expiration of the extended benefits would cut economic growth by about 0.2 percentage point next year, the Congressional Budget Office estimates. The gravest scenario would be if the budget talks collapsed, negotiators went home and the tax increases and spending cuts appeared to be permanent. In that case, Macroeconomic Advisors, a forecasting firm, warns that the Dow Jones industrial average could plunge up to 2,000 points within days. Businesses would turn gloomier in anticipation of Americans paying higher taxes. Retailers would order fewer cars, appliances and clothing. Consumers' confidence would likely plummet, followed by their spending. The economy would shrink at an annual rate of 0.6 percent in the first three months of 2013, estimates Joel Prakken, an economist at Macroeconomic Advisors. That compares with an estimated 1.9 percent growth rate if a deal is reached. CBO forecasts that the economy would decline 0.5 percent in the first half of 2013 and fall into recession. The unemployment rate would rise to 9.1 percent from the current 7.7 percent. Most economists are counting on fear of such a disaster to prod Congress and the White House to make a deal. But analysts expect the Social Security tax cut and extended unemployment benefits to end. Those two changes would lower growth by 0.7 percentage point next year, the CBO estimates. Under that scenario, Social Security taxes would revert back to 6.2 percent on the first $110,000 of income, up from 4.2 percent. The increase would cost someone earning $50,000 an extra $1,000 a year, or nearly $20 a week. Some consumers have been getting nervous. Mike Duke, CEO of Wal-Mart Stores Inc., said Tuesday that in a poll last month of the store's shoppers, an overwhelming majority were aware of the threat of high taxes from the cliff. And some said it would lead them to cut back their holiday buying, Duke said. Wal-Mart, the world's largest retailer, is considered an economic bellwether. Consumer confidence fell sharply this month, according to a survey by the University of Michigan, partly because of worries that taxes will rise next year. For all their combative rhetoric, the White House and House Republicans have identified areas that could underpin a budget deal. Both sides concede, for example, that higher tax revenue and lower spending on programs like Medicare, the government health insurance program for the elderly, will be included. Whatever the outcome, some trends could offset part of the economic damage. Ashworth notes, for instance, that the average retail price for gasoline has dropped 15 percent this fall. Lower gas prices give consumers more money to spend elsewhere. On Tuesday, the Business Roundtable, a group of large company CEOs, urged Congress and the White House to avoid the cliff by striking a budget deal containing about $4 billion in tax increases and spending cuts. AP Business Writer Anne D'Innocenzio in New York contributed to this report.